A stinky dog is more than just smells. The cause of a stinky dog face is typically related to trapped moisture, bacteria, an infection or health disorder. With daily care and maintenance from Wrinkle Balm, your dog’s stinky face problems can become a thing of the past. All-natural and organic Wrinkle Balm is safe on even the most sensitive dogs, while slaying bacteria, yeast and other skin issues that create foul odors. When paired with daily care and proper cleaning of your dog’s face, Wrinkle Balm actively destroys the source of bad odors. That means you can go back to smothering your dog’s face in kisses without gagging. What Causes Your Dog’s Face To Stink In The First Place? Wrinkles allow moisture to build up between the delicate skin folds. These dark and moist places become an ideal breeding ground for all sorts of bacteria or yeast infections—hence the smell. If your dog has excessive tearing (epiphora) and drainage of the eyes, all of this moisture builds up on hair and skin and creates a nasty odor – indicative of bacteria. 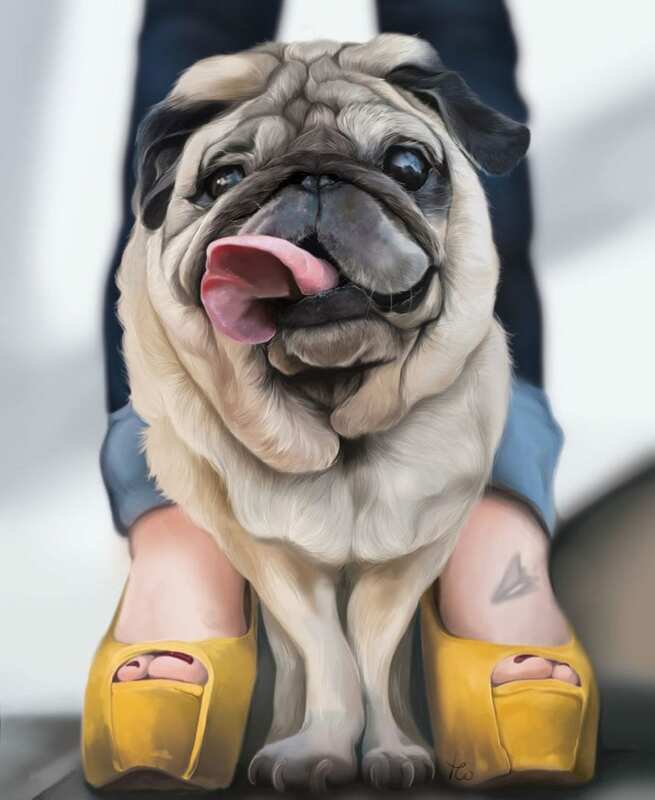 Dogs that commonly experience this issue include the Shih Tzu, Maltese, Poodle, and brachycephalic breeds (breeds with short noses) like Pugs and Bulldogs. Short nosed dogs are especially prone to this problem because moisture becomes trapped in their wrinkles, where it can really become infected and stinky. Bacteria cause odors that bother dog owners, but they can also create a persistent itch that bothers your dog. If your dog is constantly scratching at his/her face, it only introduces more bacteria to the surface. Plus, excessive scratching can lead to your dog cutting and damaging the sensitive skin on his/her face or eye surfaces. If dogs are allergic to something in their environment, it can cause the skin on their face to become more sensitive to developing a secondary skin infection. The risk for this is even higher if your dog is constantly scratching at his/her face. Secondary skin infections often have a unique odor, sort of sweet but still repugnant, caused by bacteria. Along with a foul odor you may notice thinning hair, flaking skin, itchiness and/or redness. Some skin infections require veterinary care in order to isolate and address the primary cause of your dog’s allergies. Often, inflamed, itchy and infected ears also plague dogs with allergic skin disease. 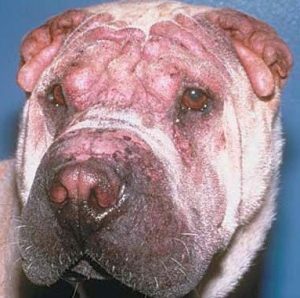 Dogs with wrinkly faces are more prone to developing foul-smelling skin infections. 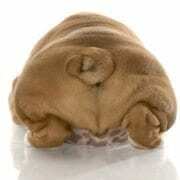 That’s why it’s so important to clean between your dog’s wrinkles multiple times throughout the day. Start by using a moist cloth to remove any dirt, debris, or food. Then use a soft dry cloth to remove any moisture left behind. By removing food, debris and moisture you make it much harder for bacteria and yeast to survive. Even if your dog doesn’t have wrinkles, wipe their face clean throughout the day to help eliminate the source of the stink. After cleaning your dog’s face, apply Wrinkle Balm all over. You never have to worry about your dog licking at it, or even eating the entire container. That’s because every last ingredient lovingly packed inside is 100% safe for your dog—no matter if it’s applied to his/her face or orally ingested. You go to give your dog a big kiss on the face only to cringe with disgust—what’s that smell? Stinky face or not, you still love your dog, but a stinky face can be hard to kiss, cuddle and love on. Wrinkle Balm makes it easy to love on your dog again, while providing soothing relief to your best four-legged pal. Try Wrinkle Balm risk-free today. If you are not completely satisfied with the results, simply send it back for a full refund. You have nothing to lose and a fresh-smelling dog to gain!